Hundreds of Texas teachers recently spent a couple days in summer school to learn the best ways to teach International Baccalaureate classes. The IB curriculum has been growing statewide because of its high global standards. Today we take a closer look at what sets it apart. At Ranchview High School in Irving, International Baccalaureate coordinator Kari Christensen is lecturing her students on a cornerstone element of this curriculum; special projects. IB students spend months on each, collecting research notes they assemble in what’s called a process journal. They’re a bigger deal than many realize. “I always tell the kids, I say you know da Vinci? He’s got all these ideas going on at multiple times and some half-done things over here, and some complete thoughts over here. That’s your process journal. It’s just everything about your project goes in there,” Christensen says. A project might be building a robot or collecting human hair to help chemotherapy patients. Christensen says some ideas from the journal may end up in the project, others won’t. “I’m kind of blown out of the water because we did ours totally different,” says Stephanie Durrett, who teaches IB students at a Dallas charter high school and realizes she needs to unlearn her approach to the journal. She thought it was like a daily diary but it’s not. It’s more comprehensive. “I think we might have been doing it the incorrect way and I’m here to learn the correct way on how to do it,” Durrett says. The “correct way” of the process journal is to let the student drive the learning, according to Mike Malnati, who’s been teaching IB for years. The curriculum goes back decades, to help educate children of English speaking parents living in distant countries. IB expanded in the U.S and arrived in Texas in 1979. Twelve years ago, there were about 30 IB school in Texas. Today there are 189 with 43 more in the works. IB is not what Malnati calls the ‘set and get’ method, where you sit in a class and take in information thrown your way. Of course facts and figures are important, but they’re not everything, says Bill Shell, a veteran IB instructor from Colorado who’s helping teach the teachers . That’s why teachers like Saran Smith are here – to learn different teaching methods. 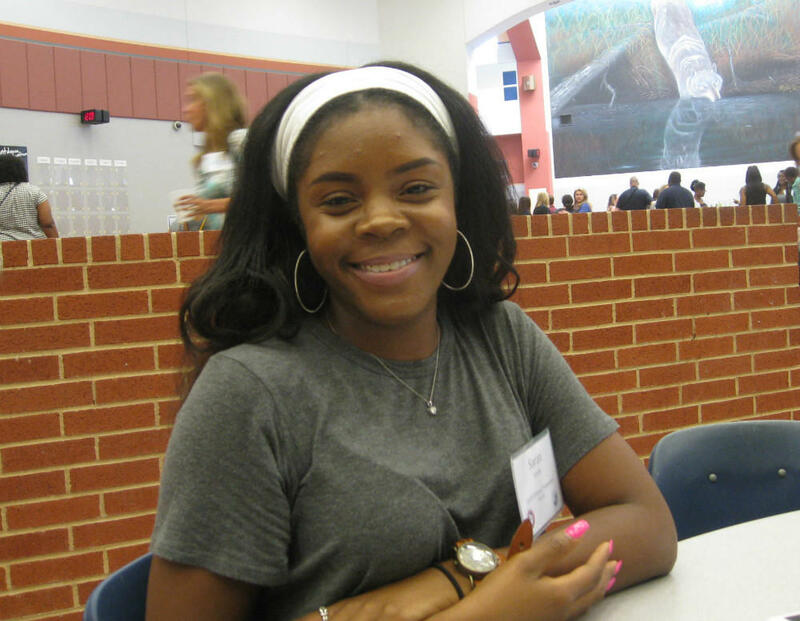 The Dallas charter school teacher likes IB’s international curriculum that includes many cultures. To teach it, she must be familiar with those cultures – things like their food, their clothing. Saran Smith teaches elementary kids using the IB curricululm. Smith loves the international approach. It keeps her on her toes. “To be able to give the kids a well-rounded understanding of what they need to learn I need to learn it as well. It’s not just they’re learning I’m learning as well so it’s full circle,” Smith says. Those are lessons she’ll take back to the classroom this fall. David Kapuku came to the U.S. with his family in 2013 after his mother won the Diversity Visa Lottery. KERA reporter Stella Chávez met David while reporting on immigrant students in North Texas for a series called “Generation One.” She recently caught up with David, who’s just graduated from high school. He talks about how the past few weeks have been filed with triumph and tragedy. When school's out, Texas schools are giving low-income kids free meals in the summer. The problem is five out of every six kids who are eligible don’t show up. However, the Arlington school district is trying to turn that around. From Alaska to Maine, Texas to North Dakota, public schools have dramatically changed during the past two decades. Walk into these schools and you’ll likely find that the majority of students are children of color.